My number one priority when I become your next State Senator is to ensure that our children receive the education they deserve. And that means making sure we recruit and retain the best and brightest teachers for our schools. So, I am incredibly proud to announce that I have been endorsed by the Philadelphia Federation of Teachers! 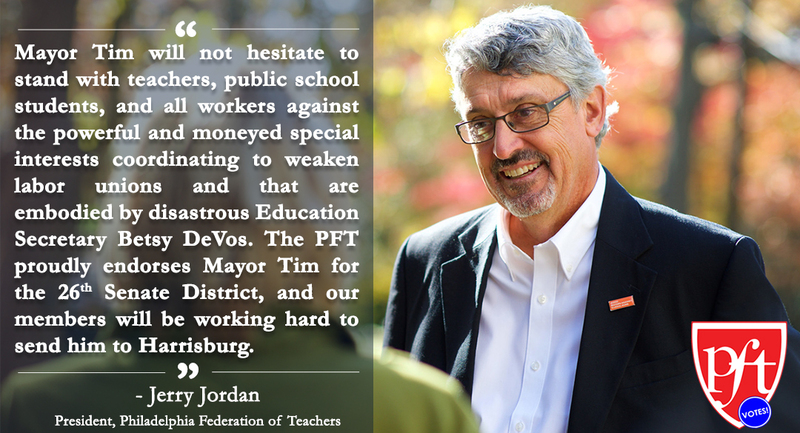 I’m honored and humbled to have the support of PFT, whose members go above and beyond their job descriptions every day to support our most vulnerable children. Our battle to reclaim the promise of public education is about so much more than making sure teachers have adequate supplies. It’s about educating and nurturing the whole child, in healthy and safe learning environments, so that every child, no matter where they live or the challenges they face at home, has an opportunity to grow and thrive. If you agree that we need to protect public education and support fair funding, please consider chipping in $15 or more today! I’m running to serve in the Pennsylvania Senate to be a champion for the underpaid teacher whose unpaid second job has been to organize against one Republican bill after another attacking her pension and benefits; for the overworked counselor who helps children navigate trauma most grown-ups can’t handle; and for the public school student who just wants to get a good education in a nurturing learning environment without fear of gun violence.